I really liked this spin on the Eyetoy technology where you use the USB camera to compete in an extreme sports title of the future racing on hoverboards! Using your body and not the controller, players need to find the fastest lines through some crazy courses that simply look awesome. The title graphically looks like a sort of hybrid betwen a cartoon and cyberpunk though I am sure that not everyone is going to agree with that. The idea of the game is simply to win. 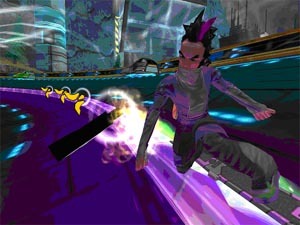 That said however, this game is a real development for the simple fact that despite the genre, this is the first FULL game for the Eyetoy Camera as every other title, including the Monkey Mania game has been a series of mini games, that whilst a lot of fun sort of break up the continuity you would get with a normal game. Antigrav has none of that, delivering a solid gameplay experience from start to finish. 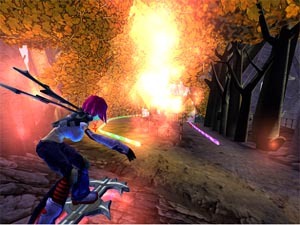 Some gamers will look at the high speed of the title and equate it possibly to wipeout or something a bit closer, the SSX series of snowboarding games, which I can tell you now that it is really nothing like. One of the things I liked about this game was the fact that there was not a crappy video image of you the gamer showing up in the background. I know that you have to see what you are doing in most of the other titles however Antigrav shows a funky locator down the bottom right that displays what your hands and head are doing at all times for easy reference. There are tricks that you can do for those who are wondering and they can be linked together for combo scores. Initially I found it a bit hard but then it was dead easy. The main drawcard really is the racing pure and simple, just trying to beat your opponent was a ton of fun! Possibly the only real downer to the title is that there are so very few courses for you to race on. About 5 in all, although they do have different courses at each location, it does get a bit repetitive, especially when you are like me and love these sorts of games and play them constantly. 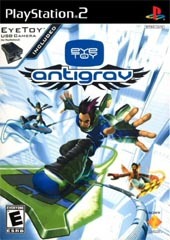 Whilst Antigrav is by itself, an amazing game for Eyetoy, if you are buying it simply because it is a board game, you would be better off getting SSX (any of them). If you are buying this as it is an innovative title that is a definite step forward for the Eyetoy then it’s a title that I can certainly recommend. Give it a try or a rent, I think you are going to like this one.